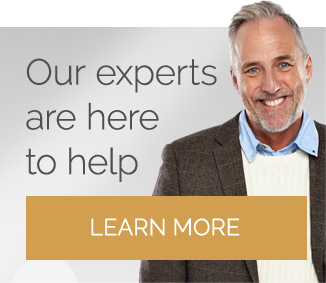 How to Calculate Diamond Prices – Don’t Get Ripped Off! With so many factors influencing the pricing of a diamond, it can seem a lot to get your head around. I am often contacted by confused buyers, who have found the conflicting prices and technical jargon completely overwhelming. For me, this takes the joy out of buying a diamond. It is, after all, an emotional and exciting purchase. For this reason, I have put together some basic rules and handy comparisons so you can begin to unweave the sparkling web of this precious stones and make some important decisions before you buy. Before we unravel the complexities of price, there are a few basic rules that must be followed first. Understanding the significance of these steps can be the difference between a knock-out purchase and being royally ripped off. They will save you from disappointment, and also save you thousands of dollars. If you have been doing your diamond research, you will no doubt have seen the matter of certification come up time and again. 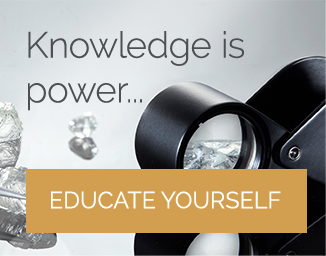 If you are buying a diamond for $1,000 or more, certification is an absolute must. It offers assurance that you are getting the exact quality that you are paying for and adds value and prestige to the stone. Make sure your certificate is issued by an unbiased and trustworthy laboratory. As always, I recommend the GIA or AGS, as they are the world leading laboratories in diamond certification. It is important to get to grips with the four Cs and understand the impact they can have on the value of a diamond. Some shapes are more forgiving when it comes to color, while others will require only the highest clarity in order to look their best. When it comes to working to a budget, all of the four Cs should start at the absolute top of the scale, and you can begin sliding back on the ones that will have the least impact on the final look of the diamond. You will also need to factor in the style; if you are going for a trilogy style ring with one large center diamond, the color will need to be a high enough that it doesn’t look yellow next to the other stones. I will explore the details of diamond pricing further as we continue, but as a basic rule it is essential that a buyer gains their own understanding of the diamond market and how very similar quality stones can be priced very, very differently. This is where online buying (or at the very least, online research) has an upper-hand over a traditional jewelry store. Sites such as Blue Nile and James Allen have huge inventories, and use comprehensive, sliding bar scales to allow you to adjust the cut, color, carat weight, and clarity of the diamond. 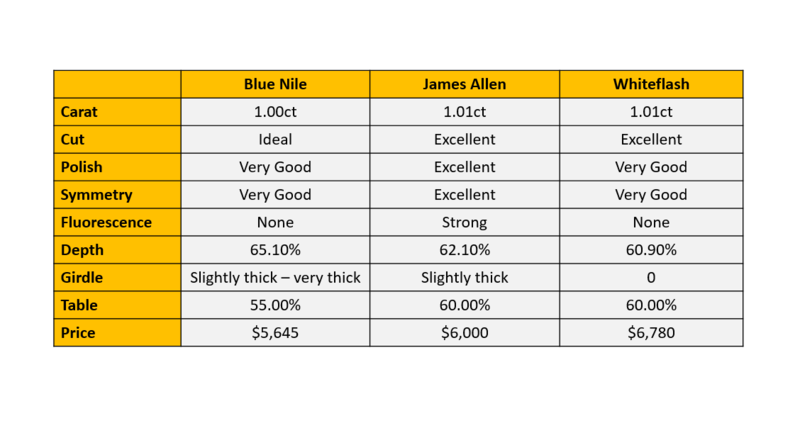 Blue Nile is also the market leader in pricing, so using their diamonds as a guide will help you understand the various premiums that other retailers put in place. This is a great place to start your research, and begin building a picture of how the smallest changes in quality and weight can make a huge difference in price. All diamonds are priced per carat, even if they do not reach the 1.00ct mark. For example, a 0.50ct diamond that is priced at $1,500 per carat will cost $750. As carat weight increases so too does the price. There will also be an increase in the price per carat, as you move into higher weight categories. So, put simply – the price per carat is not fixed. Using our previous example, if we look at a 1.25ct diamond, the rate would no longer be $1,500 per carat, because the diamond has moved up into a higher weight category. The weight categories essentially drive the prices of the most ‘desirable’ carat weights. For example, there will suddenly be a large price hike between a 0.99ct diamond and a 1.00ct diamond (around 20%), whereas there will be very little difference between a 0.99ct diamond and a 0.98ct. This is simply to do with the desirability and emotion involved in the purchase; being able to say, ‘It’s a one carat diamond’ and having a satisfyingly rounded number. It may seem trivial for such a significant price increase, but as history has shown us our desire for the perfect diamond means we are often willing to pay the additional cost. This demand also means that many diamond cutters will compromise the perfect cut to give a more desirable carat weight. This decision is one of the primary causes of the poorly cut diamonds sold on the diamond market today. But surely a well-cut diamond will still be worth more? This question unearths the sad truth about diamond cutting and the pressure from chain distributors. When a rough diamond is found, the cutter will assess the stone for its optimum cut. This is the cut that will allow the most fire and brilliance from the stone. If this falls just below the 1.00ct mark, it is likely the cutter will sacrifice this quality to give maximum yield. If, however, a rough diamond is found, and its optimum cut is at 1.00ct, it will be worth a great deal more than the stone where the yield has been forced at the sacrifice of the cut quality. The end goal for a large chain distributor is profit – they will make a greater profit on average cut diamonds around the 1.00ct mark than they will on exceptional stones that fall around 0.75-0.85ct. As a Diamond Expert, I tends to sway towards Whiteflash for their A CUT ABOVE® diamonds. But if budget restricts, do not hesitate to consider James Allen. Once you have a grip on the basics, it’s time to delve into the world of diamond trading and the Rap Report. 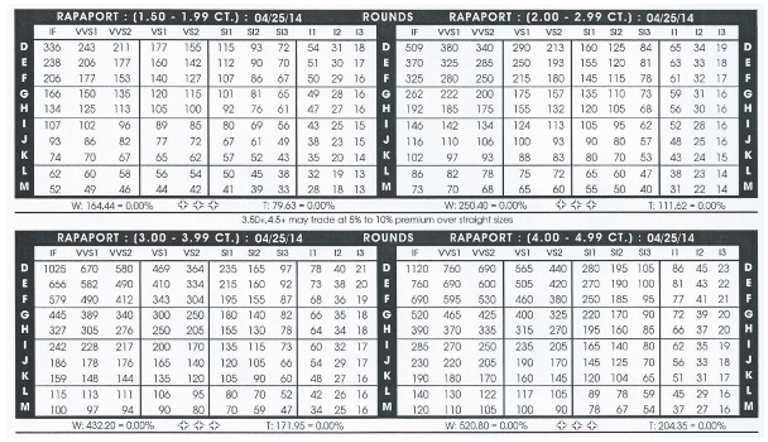 In 1978, a diamond broker named Martin Rapaport created the Rapaport prices list (known as the Rap Report). Released every Friday, it continues to be used a baseline for trading prices on nearly all loose diamonds sold as individual stones. To understand how to read the Rap Report, I will be using the sample rap list above. 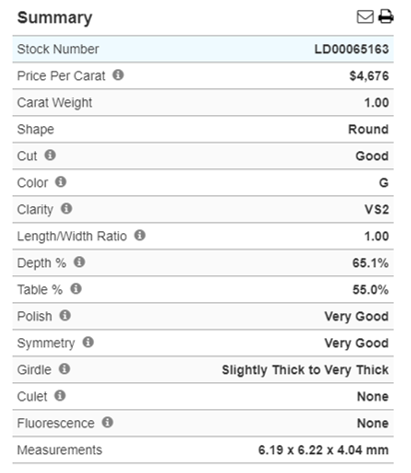 Each grid shows the carat weight categories across the top. Just below this, heading the columns we see the clarity grades, and running along the left-hand side are the color grades. The numbers within the grid are the prices. These prices are always listed as hundreds. For example, a 3.00ct D-VS1 would have a Rap Report value of $46,900 per carat. A 3.98ct D-VS1 would have a Rap Report value of $46,900 per carat. But a 4.00ct D-VSI would have a Rap Report value of $56,500 per carat. It is here we truly see the significance of the weight categories. You may also notice there is no set pattern or consistency as to the price differences between color grades and clarity grades. Sometimes the changes are small, other times there seem to be greater leaps. There is no black and white reason for this. Unless a career change into diamond brokerage is on the horizon, I would simply advise that you take the time to assess when a move up the grades is worth the price increase. For example, moving from an E-VS2 to a D-VS2 would cost an additional $1,300 per carat. Moving from an E-SI2 to a D-SI2 would cost an additional $300 per carat. The decision to move up or down a color grade is subject to your priority and budget. The Rap Report should be used as a demonstration of how the diamond market works. The reality is, no one will pay the prices on the list. Buyers will haggle traders down, and the final price of the diamond on the retail market will bare little resemblance to the trading prices. It is more helpful to look at actual examples from retailers to get the best value for money. This is also a better way to get to know premiums, and more specifically, how much of a premium is reasonable. Always expect to pay more in a jewelry store, for the overheads are far greater than those of an online retailer. You can read more about the differences between online retailers and jewelry stores in this article. I am going to show you three examples of variations in diamond price. In each case I have selected the cheapest diamond within the selected grade of G-VS2 from three famous online diamond sellers. Sensational – it will be within the G-H color range and VS1 to SI1 clarity. Signature – it’s promised to be within the I-J color range and VS1 to SI1 clarity. First, let’s break down the quality of each diamond, starting with Blue Nile. I have pointed out the two areas where this diamond falls short on the perfect proportions for a round brilliant diamond. Both of these flaws will impact the price. Aside from these, the rest of the data shows a good quality diamond, with no fluorescence and impressive measurements. 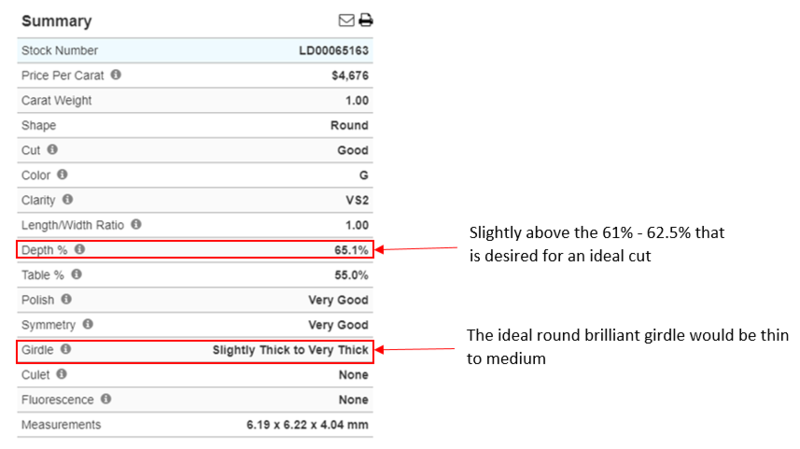 While the overall polish is higher on the James Allen diamond, it still falls slightly short of the ideal measurements for a round brilliant cut. It also has strong fluorescence which impacts the price of a diamond. Each diamond shows very small deviations from the perfect cut measurements. It is likely that is was to be able to offer a full 1.00ct diamond. It would be easy to assume that Whiteflash has the highest premium, however, when we look at the data we see that of all three diamonds, it is the best quality. When buying a diamond, either online or in a jewelry store, there are certain specifications you should expect to see. These are the intricate details of the stone which come together to create a picture of the quality. 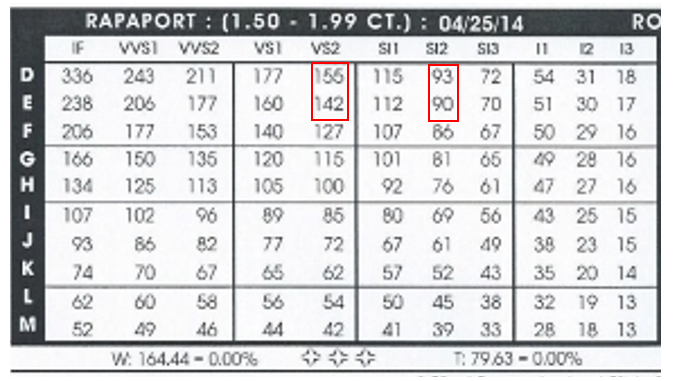 Understanding these proportions and percentages is comes down to diamond yield and diamond quality. 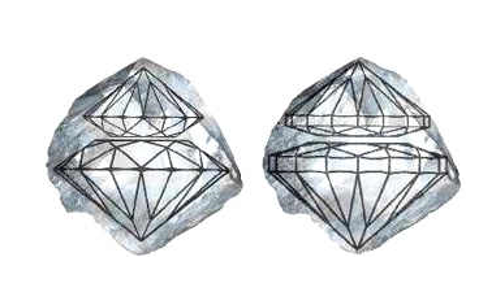 These illustrations show the same rough stone; on the left we can see the cutter is able to produce two well proportions diamonds. On the right, we see the potential for two diamonds with a much larger yield (carat weight), but they are poorly proportioned and would therefore be of a lower quality. 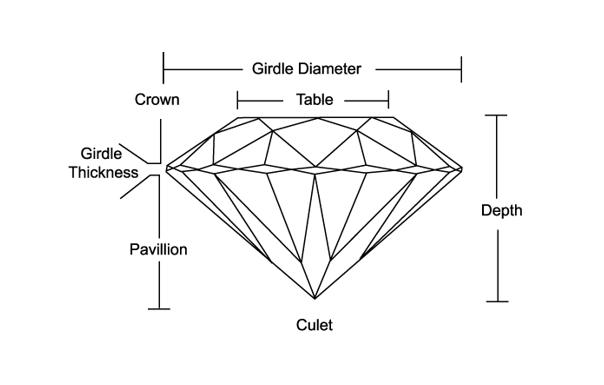 Depth refers to the distance between the culet and the table when the diamond is viewed on its side. This measurement will dictate how well the diamond returns light. If the diamond is too shallow, light will hit the pavilion at a low angle and be refracted, escaping through the bottom of the diamond. If the diamond is cut too deep, the light will refract from the first pavilion, but will hit the second pavilion too low. Once again, the light will escape from the bottom of the diamond, reducing light return and sparkle. The table proportion is calculated by dividing the table width by the overall width of the diamond. If the table is too small, it will limit the amount of light that is able to enter the diamond. If the table is too big, the upper facets are unable to disperse the light. As seen on the diagram, the girdle is the perimeter between the crown and the pavilion. If the girdle is very thin, it will compromise the durability of the diamond, making it more prone to chipping. If the girdle is very thick, it will make the diamond look smaller. The culet describes the thin point of the end of a diamond. When diamonds are properly cut, the will all meet uniformly to a single point, thus yielding no culet. Any presence of a culet will affect the appearance of a diamond. These are just a few examples of the diamonds and diamond qualities available on the market. As always, quality should be paramount when choosing a stone, however you should also explore the additional services offered by a vendor. 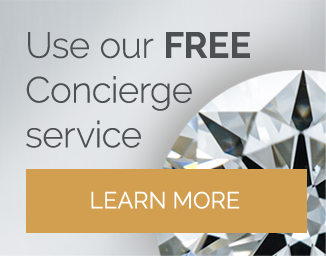 As a minimum, a professional diamond retailer should offer an aftercare service, a lifetime guarantee scheme and exceptional customer service and product knowledge. While these aspects may all go some way towards increasing the premium, they are essential in ensuring you peace of mind in your purchase. In this instance, the first contender to kick out of the equation is James Allen because of the strong fluorescence. So now we are left with Blue Nile and Whiteflash. Blue Nile’s Depth is way out of the ideal range, while Whiteflash’s just little bit out of the range. Another point to consider between these two diamonds is the girdle, one is way too thin and one is way too thick. 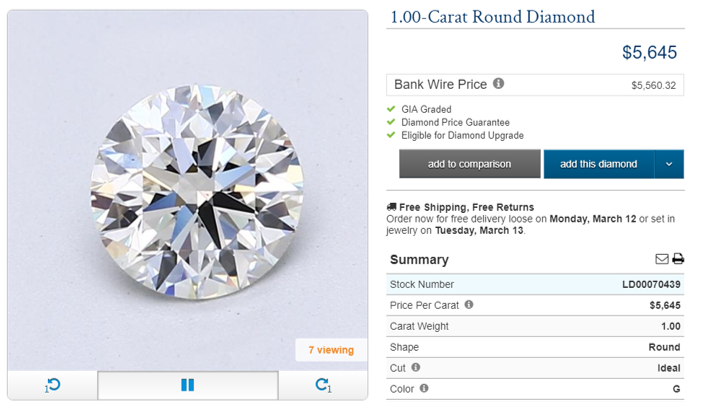 Both diamonds’ cut is GIA Excellent, which means they are the best cut you can get for a diamond; however, I do have one tiny qualm with Blue Nile’s listing, it should have used “Excellent” instead of “Ideal” to describe its cut so it doesn’t confuse the buyers during comparison. So which one should you buy? Now it’s depending on your budget. If you could stretch it a little further, go with Whiteflash, but if you can’t then Blue Nile is your next best option in this case. My final advice would be to take all you have learned, and spend some time exploring the various possibilities until you find the stone and the service that is perfect for you. Just copy the table I have above and fill in the information of the diamonds you’d like to compare and make a decision from there. As always, get in touch if you’re unsure about anything and I’ll do my upmost best to help you to buy the best diamond you can afford.